Stand Up Paddle Surfing: Coming Soon: Boards that you want... but can't have! Coming Soon: Boards that you want... but can't have! This is Stu Kenson. In his hand is a 5'8" epoxy fish made of EPS foam with a vacuum bag lamination of carbon fiber and epoxy resin; basically indestructible. Now blow this board up to, say, 11'0" repeat the exotic layup, throw in a high end hot rod spray job and what have you got? A board that you want- but can't have. Check back for the full story! 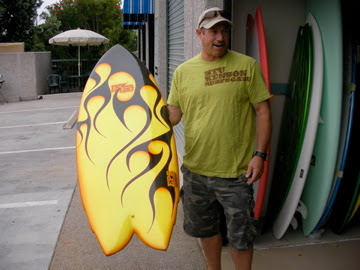 hey why is it so hard to get a vacuum bagged custom board in CA, looks really cool. In rowing we have been vacuum bagging and using carbon for 20 years... I like the fish concept and interested see how this would work on a TUNA in the 240-260 class like myself.